Jeffrey Gaines performs songs off his new album, "Alright," on Jan. 31 at Ardmore Music Hall. 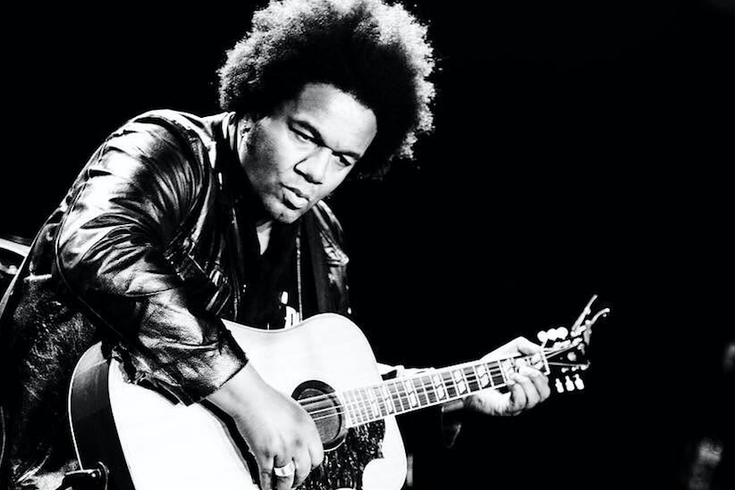 Since the release of his self-titled, 1992 debut album, Harrisburg native Jeffrey Gaines has won worldwide acclaim for the timeless qualities of his songwriting. Five lilting studio albums filled with soulful, Bowie-meets-Costello musicality and introspective lyricism will do that. So then, for a noted singer-songwriter such as he to not release an album of new tunes in 16 years, may be perceived as odd. It's not to Gaines though, who breaks that silence with a new album, "Alright," which will have its release party on Jan. 28 at Ardmore Music Hall. "The songs still get written," Gaines said from his home in Devon, Pa.
"It works, however, as it has always worked for me: I put records out when somebody pays for them, when I have a record company." The highly pragmatic Gaines stated that between 2002's "Toward the Sun" (Artemis) and the brand new "Alright" (Omnivore), that he didn't have a record deal behind him or the monetary motivation to release his own music. "I was in the record business in the 1990s and the early 2000s because I had a deal, not because I'm an ambitious person. I don't write songs out of catharsis or need, I write when I am inspired to write. But once I've done that, I have no interest in necessarily having other people hear them." With that, Gaines proves that he has no real desire to play to the pop marketplace, so to speak, but instead, he exists in his own musical universe. As a small, mobile solo unit – just him and his guitar – he can pick up and play anytime and anywhere, from a "coffeehouse with 15 people to a stadium with 15,000, the job is exactly the same," he said proudly. "Once I have written down that thing that is in the back of my mind, or that which I am trying to understand – my songs are not topical – and pleased myself musically, that is the success. When a painter paints, he has fulfilled his desire or goal. Taking it to a gallery is another set of ambitions. I can play it live and that is fine. When somebody such as a record label finds a use for me, well, I love being useful, so if it pleases them, it definitely pleases me." Gaines even jokes about having friends or fans in the business who believed that the singer-songwriter may have quit music ("or even died," he laughed), because he hadn't released a studio album in some time. "I have to remind them that I am still out here, playing live, nearly every night somewhere on the planet." Once invited to make an album, the singer mines his backlog or writes new material to suit his band at the time. He finds these musicians in a unique fashion: Recruiting entire bands fresh off of a tour to jam with him. This is how he found David Bowie's group that Gaines used on 1998's "Galore," and Elvis Costello's crew for "Alright." I have to remind them that I am still out here, playing live, nearly every night somewhere on the planet." "The stuff on 'Alright' made sense because of the opportunity I had with its personnel – if I'm going I do an album with Elvis Costello's longtime drummer, Pete Thomas, I'm going to pull out songs that are in his wheelhouse, a la 1978 pub rock. When I did my first record, I used Philly's Maggie's Dream because they already had their own groove and connection that I just jumped in on. Before I did 'Galore,' I hung backstage at Bowie shows and approached his band when the tour was over, and they were still nice and tight." Even though "Alright" is done and the songs are ready, Gaines is always a little reluctant to release a new record. "I have seen what awaits them: scrutiny," he said with a laugh. Either way, it will be business as usual when he hits Ardmore Music Hall with his new baby. "Just because I release a new album, nothing has changed. I'll be out there on my own – just me and guitar. Selfishly, you wish life would change, but what would I do with more? All I would wind up with is bad habits and ridiculousness – rock star stuff – so let's just keep going as is." Jeffrey Gaines appears Sunday, Jan. 28 at Ardmore Music Hall, 23 E. Lancaster Ave., Ardmore. Tickets are $20 in advance; $25 at the door. Show time is 7 p.m. For more information, call 610-649-8389 or click here.